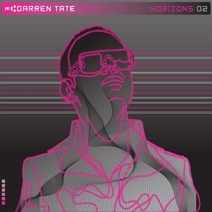 Darren Tate's Horizons 02 (the follow up to the massive Horizons 01) is an explosive trance journey consisting of not just some of the biggest club moments of the last few years but six stunning new singles never before released. Pretty much every A&#8208;List DJ has supported many of these fantastic records, including huge club moments like 'Echoes', the Computer Music Mag featured 'On The 7th Day', 'I Would Die For You' and many more. However it's the new singles that will be setting clubs alight this year with massive new anthems such as the gorgeous 'When The Morning Comes', the monstrous 'Reverse The Silence', the electro&#8208;infused 'Sun Electro' or 'Kireii' (Darren's exclusive mix for the title track from the forthcoming feature film 'Royal Kill') . And if that's not enough the album includes the world premier performance of 'Dark Skies', written and orchestrated by Darren and performed by the Czech National Symphony Orchestra!